Avoid the blistering heat, the harsh sand, and the hectic winds as you search for treasures in the sandy desert. Click here to play! Your faithful camel will be your guide, but keep your eyes peeled because the riches may just go unnoticed! 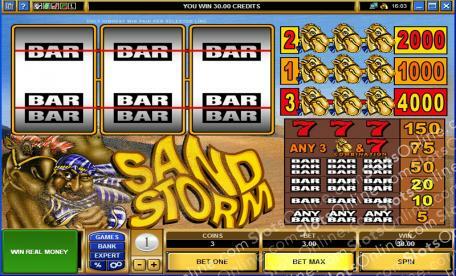 Sand Storm is a fun 3-reel slot played across three pay lines, where the more lines opened up increases your chances of winning. There are no Wilds or Scatters to distract you from winning, just pure monetary payouts! You can wager up to three coins on each slot, and they will determine the payout amounts on the best combos. For example, if you only play a single coin, you can only win the jackpot on the first pay line for 1,000 coins. Whereas if you play all three coins, you can win on the second and third pay lines, up to 4,000 times your initial wager. Take a trip into the Sand Storm and emerge with the riches of the desert!